Amazon has been offering cloud storage for a while now. It was only offered to its Prime members though. Today, however, they’re jumping all in by offering two unlimited packages: unlimited photos for $11.99 and unlimited “everything” for $59.99 per year. Free three-month trials are available for those who want to test it out. The former package offers unlimited storage space for photos only. There is only 5 GB of storage for other files. The latter option is for those who want to store everything online—photos, videos, files, documents. Amazon wants to lure in customers who have files scattered over various devices and don’t know just how much media they have. As you know, Amazon isn’t the first to enter this highly competitive space. 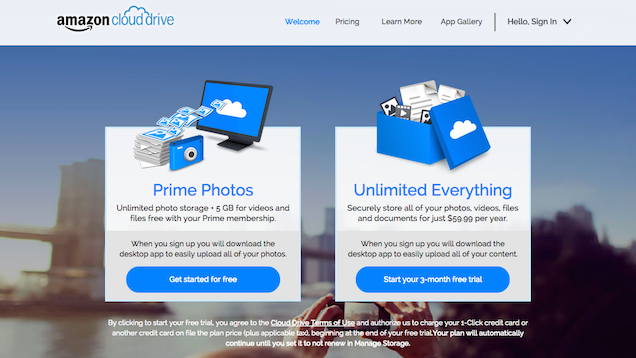 Dropbox offers unlimited storage as part of its business plans. Google does the same through its Drive for Work plans. Microsoft has similar offerings for those who subscribe to Office 365, which includes licenses for Microsoft Office and OneDrive space. Amazon, however, is keeping it simple and undercutting its competitors with its cheaper price tags. Their plan, I believe, is to convert the masses who have yet not backed up their stuff online.